GROHE Zedra – solid steel for convenience and performance! Looking for a premium, practical and beautifully designed kitchen tap? Then the GROHE Zedra is your perfect choice. This product line is crafted in fluid shapes and has a distinctive lever design. Finished with a scratch resistant chrome coating, a quick wipe with a cloth is all it takes to polish the super smooth surface to a radiant sheen. Experience the convenience of its high spout, which is perfect for filling big pots, and enjoy the cleaning power of the spout which swivels through 360°. 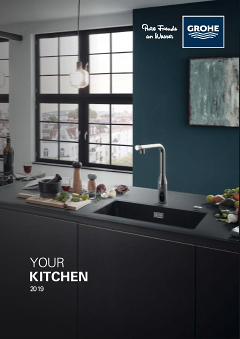 GROHE Zedra – a great all-round product that rises to every kitchen challenge!